If you are into the beauty of nature, Spring in Japan will make you ecstatic as plum and cherry blossoms fill the air with heady scent and a carpet of pink flowers blankets the ground under trees. Masses of tulips start to show their faces, along with thousands of azaleas, followed by the magnificent mauve of flowering wisterias. Spring is when many Japanese gardens look their best, the air in the countryside is fresh and clean and there is a rejuvenating bounce in everyone’s step after Winter fades to just a memory. 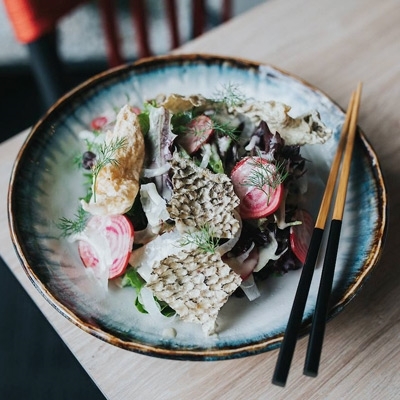 In Australia, we are embracing Autumn in all her glory…while there may not be blooms everywhere, it is still a perfect season to pick up your chopsticks and head to some of our favourite Japanese restaurants around the country. For Japanese like you’ve never had before, the Kobe Jones group delivers on all platforms at its Sydney and Melbourne locations. 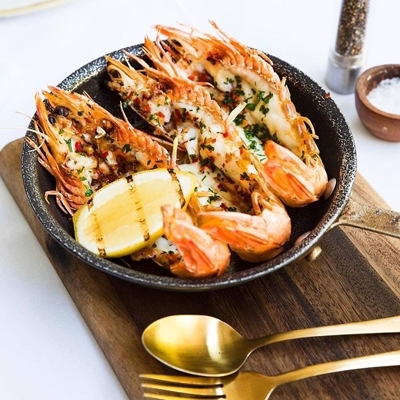 Stylishly upmarket and situated on King Street Wharf, Kobe Jones Sydney offers Japanese with a Californian twist, as seen in dishes like miso baby back pork ribs, poached in sake and red wine. 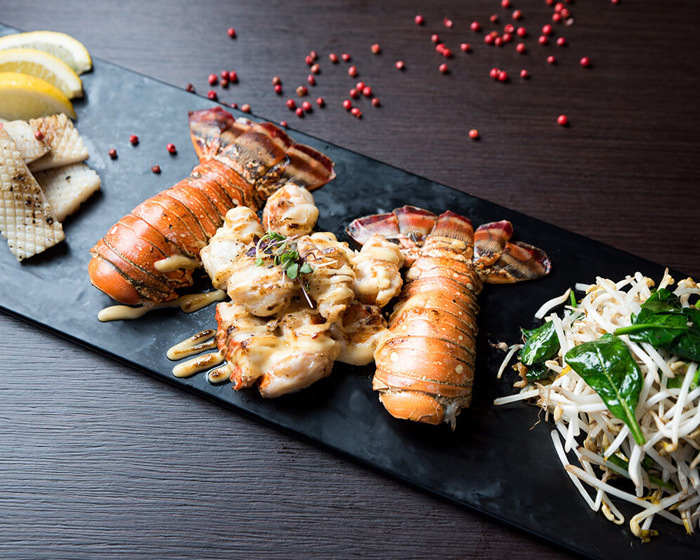 Australia’s newest and largest teppanyaki table, Wharf Teppanyaki brings 12 cooking stations and seating for 46 guests to Sydney’s King Street Wharf. 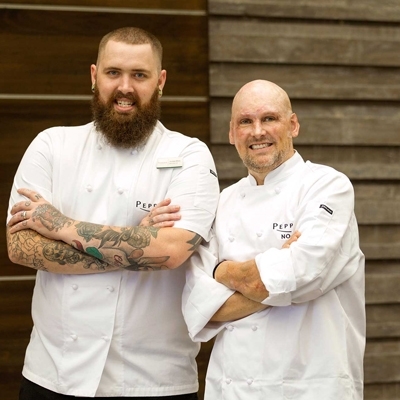 Diners eagerly watch talented Chefs prepare and cook plates such as Hokkaido scallops and Master Kobe Wagyu, before their eyes. Nestled in a heritage listed building built in the 1880s, The Rocks Teppanyaki retains its original historic shell, with an interior revamped with salmon pink walls and fine furnishings, gracing each of five intimate dining rooms. Expect to taste teppan tempters such as Western rock lobster and Darling Downs Wagyu tenderloin, along with assorted vegetables and salads. 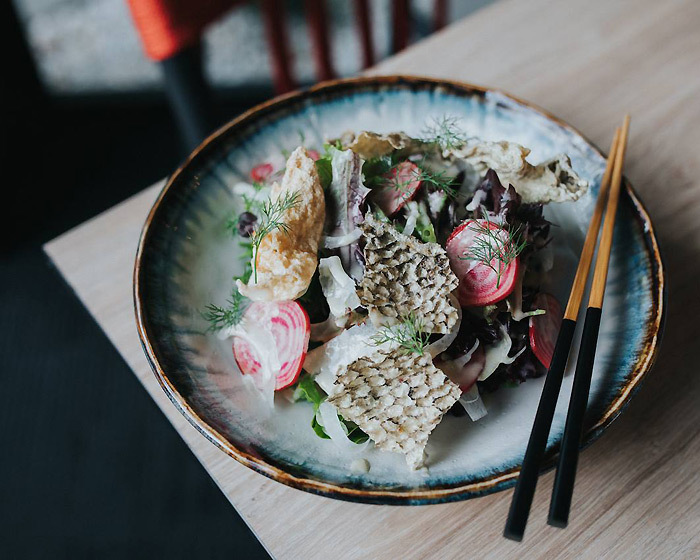 Melburnians looking for a Japanese feast head to Kobe Jones at WTC Wharf right on the banks of the Yarra. Diners arrive in droves for their Japanese journey and pass around plates like Russian black cod, gently seared on the teppan, basted with a buttered macadamia crust, served with white radish and steamed spinach. A modern Oriental touch and stunning position make Riverside Teppanyaki a stylish Melbourne dining destination. Situated on the promenade of the Yarra River, this restaurant boasts an industrial, minimalist space designed with stainless steel fittings, red upholstered seating and a vast marble teppanyaki table. 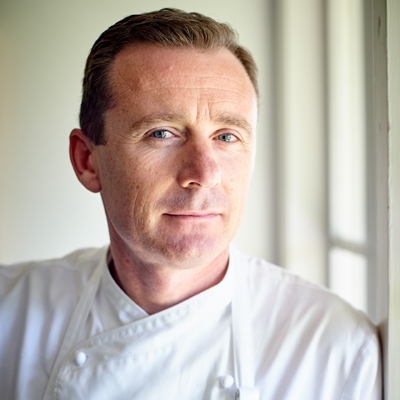 While watching the ebb and flow of the river, delve into delights like Alaskan crab, grilled oysters and Wagyu roll. Taiyaki at Otsu, source: Jess, Instagram. Specialist Japanese dessert eatery, Otsu Taiyaki on Forest Road in Hurstville, presents a vibrant vibe of neon signage, subway tiles and amber pendent globes, ideally matched by the colourful fare on offer. 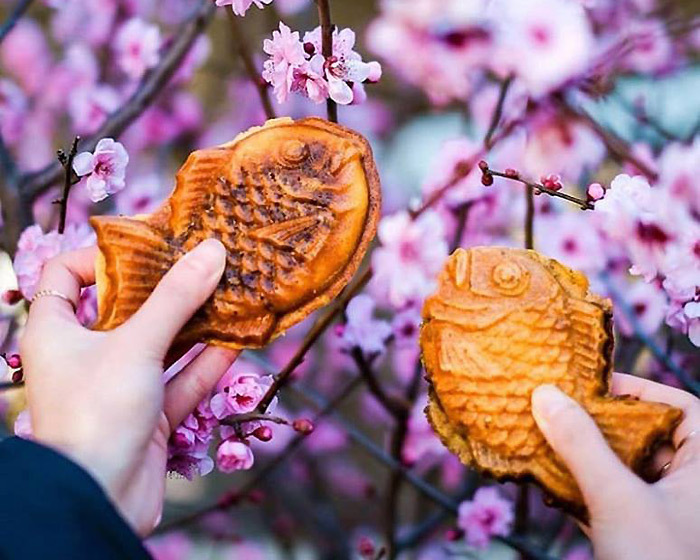 Literally meaning baked sea bream, taiyaki is a fish-shaped cake made using pancake or waffle batter and filled with centres like red bean paste, matcha green tea and vanilla custard. Otsu also offers shaved ice snow cones, along with a range of breakfasts such as avocado, chilli, paprika and sesame on toasted sourdough; or a cheese, mushroom and bacon omelette, served with a garden salad. Discover the hidden Darwin gem of Le Bistro Rakuya, where French and Japanese cuisine meld together to create traditional dishes infused with a modern twist. Located in Casuarina Shopping Centre, this modern venue has been styled in a simplistic and contemporary fit out with playful pops of colour setting the scene for sensational sushi, bao, dumplings, poke bowls and Japanese curries. Perhaps start with tropical dragon rolls, before a pork katsu sandwich with wasabi mayo, housemade pickled cabbage, pear and lettuce coleslaw; while those with larger appetites can tuck into chicken curry, pumpkin, steamed rice and sourdough. Karakuchi Ramen at Shujinko Elizabeth. For steaming bowls of ramen Tokyo-style, Melburnians head to one of three Shujinko restaurants in the heart of the CDB. The Elizabeth Street restaurant exudes a traditional vibe, with intimate surrounds ideal for drowning out cold days with classic Japanese-inspired soups and gyoza dumplings, all freshly made in house. At Flinders Street, streams of diners find a place to fill growling stomachs at any time of day or night, with dishes like karaage fried chicken, fresh salad and lemon, or takoyaki octopus balls, mayo and dried bonito flakes; before demolishing a bowl of black ramen and shellfish soup. 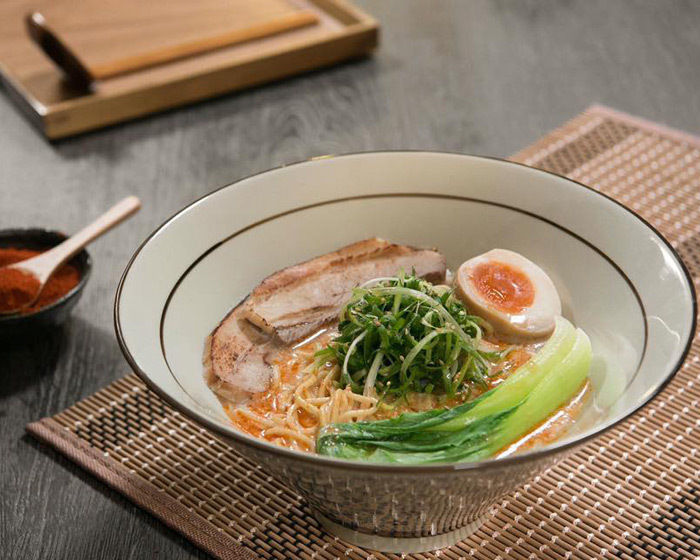 Russell Street diners may embark on their Japanese journey with steamed edamame soy beans sprinkled with salt; followed Shujinko’s signature ramen in tonkotsu soup, with bok choy, spring onion, bean sprouts, marinated egg and grilled pork belly. Soft shell crab tempura at Kosaten. South Hobart diners say Konichiwa to Oriental fare at Komatsu Japanese Cuisine on Davey Street. Guests are greeted with a bow and sassy red décor, accented by artwork, bonsai trees and splashes of green to create a calming zen vibe to enjoy sushi and sake. Choose from an extensive range of share plates, such as pork gyoza, crispy fried calamari and yakitori chicken skewers; or delve into Chef’s special dragon rolls, with crab stick, cucumber and avocado, topped with salmon, tuna and prawn. Those with more adventurous tastes may try grilled eel with unagi sauce. Styled with an eclectic mix of artwork set against an industrial fit out, Kosaten Japanese restaurant tempts diners with dishes bursting with colour and arriving at the table via a moving train. Set in the trendy Salamanca Market precinct in the heart of Hobart, Kosaten dishes up Nigiri options such as lightly torched squid, with fresh lemon zest on a bed of sushi rice; or try a fresh salmon, avocado and cucumber roll, topped with wasabi leaf. Meat lovers will salivate over premium Wagyu beef, lightly seared and served with asparagus sauce and slivered almonds; washed down with a glass of sparkling sake. 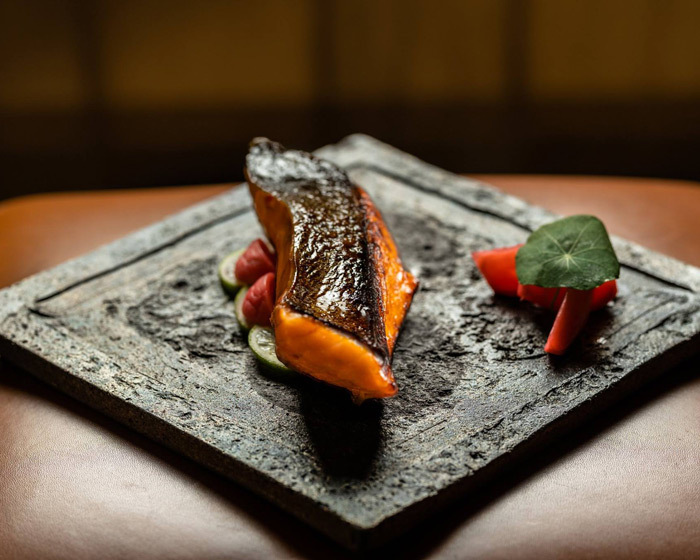 King Salmon at Raku Dining. 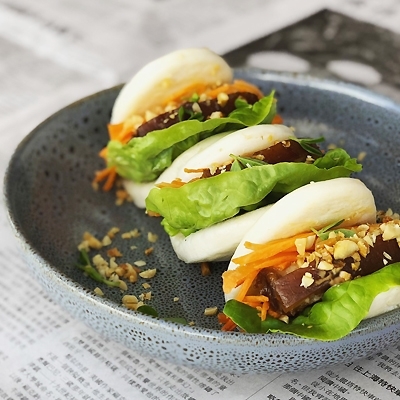 Delivering art on a plate, Raku Dining on Bunda Street in Canberra combines the precision of Oriental cuisine with the vibrant energy of Mod Oz dining. Raku is all sleek lines, pale wood tables and stools, mixed with glossy tiles and floor-to-ceiling glass windows, creating a trendy vibe to delve into starters of tuna tartare, wasabi miso and crispy rice cracker. 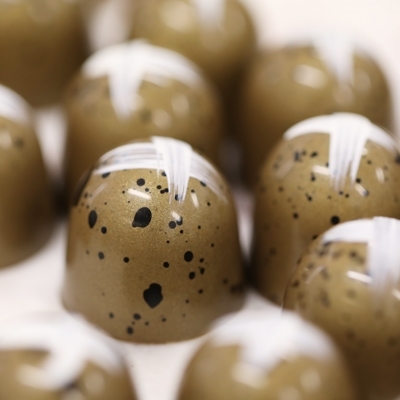 For the main affair, try lamb short ribs, chilli miso and sweet soy, or slow-cooked octopus, XO miso, yuzu koshou, Brussel sprouts and sea spray; finishing indulgently with chocolate crunch, seasonal ganache, chocolate orange mousse and charcoal cocoa butter. Originating in Japan, the concept of Pepper Lunch is that the plate itself is the grill and the diner is the Chef. This unassuming restaurant on Bunda Street in Canberra gives way to a welcoming interior of warm brick and wood panelling, complete with stone tiled bar, light wooden dividers and lifelike artificial grass. Sizzle it your way with a signature dish of curry beef Pepper rice with sides of onion rings and sweet potato wedges; or heat things up with a devil hot chicken katsu curry, miso soup, seaweed shake salad and large rice. BBQ octopus with fennel, wakame and squid ink foam at Mimasu. Join friends at the neon-lit bar to share an after work drink, or relax at high tables while perusing a menu offering a contemporary Australian spin to traditional Izakaya fare, at Mimasu on King William Street in Adelaide. This Chef-hatted restaurant focuses on share plates, ideally complemented by an exclusively Japanese beer, sake and whisky selection. 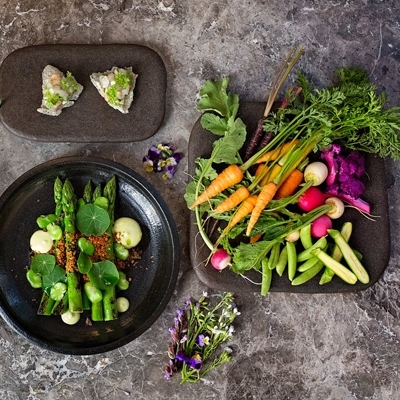 Expect nibbles like lotus root chips, nori and wasabi aioli; before barbequed octopus, fennel, wakame and squid ink emulsion, or perhaps miso glazed Coorong mullet, kohlrabi and karashi remoulade and samphire. Crispy salmon skin salad with mixed cress, daikon, fennel, baby beet and yuzu kosho dressing at Yamagen. Contemporary red lantern-clad Misono Japanese Steakhouse on Ferny Avenue in Surfers Paradise is more like a theatre and every table a stage where Chefs deftly flick, chop, toss and juggle meat and fresh seafood around the hot plate to the awe and delight of diners. Tucked inside Marriott Surfers Paradise, guests can pair a signature Samurai Kiss cocktail with innovative a la carte dishes like Misono Stars sushi maki of salmon, cooked tuna, avocado and seaweed, topped with flying fish roe, or for the ultimate indulgence opt for the Samurai six-course banquet of fillet steak, chicken and scallops. 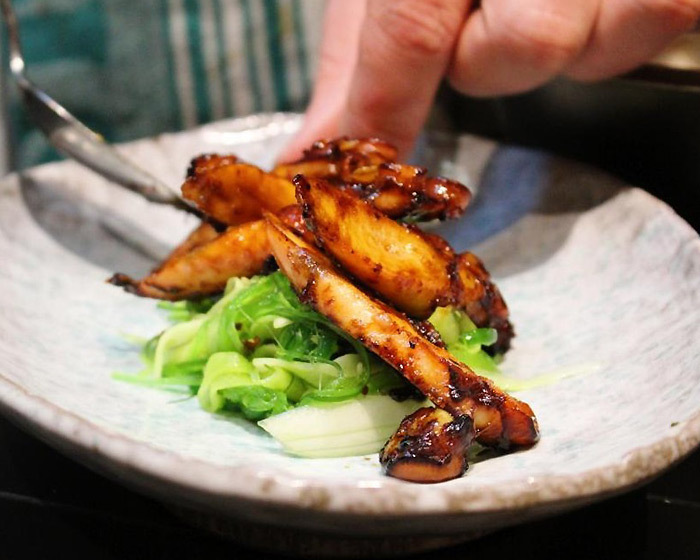 Experience the hustle and bustle of innovative izakaya dining at Yamagen in Surfers Paradise. Nestled in the QT Hotel on Staghorn Avenue, this vibrant restaurant blends old school Japanese tradition with new school Chef invention to dazzle guests with style and speed as robata grill dishes appear in front of their eyes. 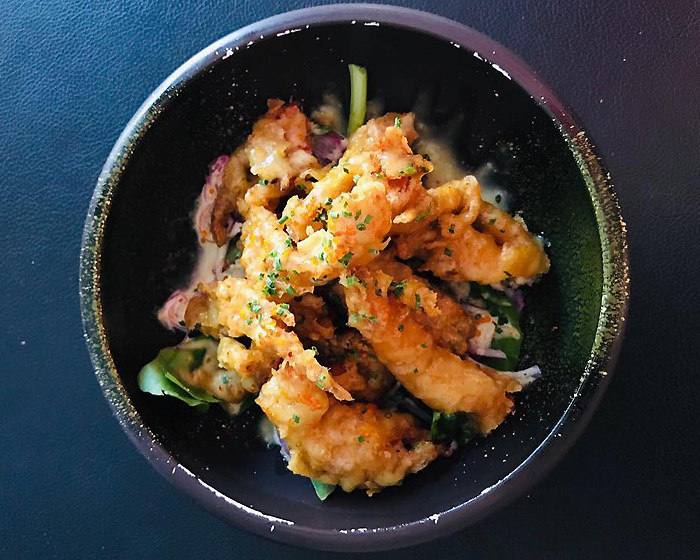 Delve into crispy pork belly with nashi pear, wasabi and smoked vinegar, or sample the sushi bar, where expertly crafted rolls and plates are prepared using the freshest fish and seafood. Finish with fried sweet doughnuts, miso caramel and wakame sugar. For more Japanese dining destinations near you, click here.